Welcome Android geeks, we are here to discuss on Xposed Framework. Android is all about modding and make it more customizable so that every user can get their own personalized experience. We have already tabled the Zooper Widget which is a highly customizable Widget app for Android users and can be molded into any widget using the modules. The Whole idea behind Xposed Framework is to add more customization option to your current Android firmware rather than installing custom ROM. With Xposed framework, developers have made it a lot easier to configure and modd different aspect of the stock ROM. You can install different tweaks named as modules. Amplify: If you want extended battery life on your device [beside Android Marshmallow Doze feature] then you can use Amplify, it makes a great companion with Greenify. Amplify extends the Greenify to take care of wake locks. When an app prevents the device from going into doze mode or deep sleep for a non-legitimate reason then amplify will take care of them. Xposed GEL settings: Google Now launcher is a great UI for Android users on Nexus or other stock Android devices. Very stable and functional launcher provides interactive experience but when it comes to customization it scores almost zero. GEL settings will give of customization option over Google Now, you will be able to add app launcher to the navigation bar, customize LED notifications, left handed mode and other enhancements. Most of the users who have updated to Android Lollipop via device update or custom ROM were waiting for the Xposed framework to release an update that can work on latest Android 5.0. Developer rovo89 has finally extended the support of Xposed Framework for Android Lollipop devices. It’s pretty easy to install, you just need a rooted device with Lollipop compatible recovery. Download the Xposed Lollipop version zip file here, and flash it using recovery as you flash a ROM or Kernel. Once the installation is complete just download this xposed apk file and install it. For now, only selective Xposed Modules are working on Lollipop. XDA forum member amit3880 is testing all modules and reporting via Module Tracker. Basic Xposed modules like Advanced Power menu, Whatsappx, Xprivacy, XBlast Tool, boot manager, XHangouts are reported to be working on Xposed Lollipop version. Xposed framework has already shown how scalable it is when it comes to customizing your device without a custom ROM. You can play with different UI and settings easily with multiple modules available online and recently the developers of Xposed Framework have rewritten the code and made it compatible with new Android 4.4 Kit Kat firmware. You can download the kit Kat compatible apk here. The app is still in beta stage so you can experience some glitches. Modules will work if they are not dependent on AOSP internal features. Custom ROMs are most used ways to get extra low-level tweaks on your Phone. Developers tweak and modify the apk files and then repack them in a custom ROM which can be easily downloaded and installed by users. Xposed framework will ask for root access when first run and install. But later it can perform without root access. Xposed framework extends the /system/bin/app_process executable to load a specific Jar [Java app] file when the system starts. This file classes and integrates with every app process and system process and thus it becomes possible for users to take control and modify applications and system behavior in real time. So no more installing and flashing ROM using Custom recovery to modd the apk files. Compatibility: Right now, around 60% Android devices are running Android 4.0 or newer version of the operating system. Developers have made it compatible for every Ice Cream Sandwich and Jelly Bean based firmware, the only clause is that you should be running an ARM processor-based hardware. This is really a downtime for old Gingerbread OS and Intel hardware users. Your Phone must be running an Ice cream sandwich or Jelly Bean OS and Rooted. Just shoot away to this link and download the latest Xposed framework apk. You will need to set up your Android settings to install 3rd party apps which are better known as Sideload to install this apk. Once installed launch the app. Now, open the framework and tap on option “install/update button” . It will take few seconds and then will ask for root access , just grant it and go ahead. The app will execute the firmware and will prompt when the process finishes. Finally, it will ask for a reboot, go ahead. When your device starts again it will take control of the system and app settings and will make it available for you to tweak. You have installed Xposed framework the next best thing you can do is to install some modules that will oomph up your Android Phone or Tablet. Modules are improvised and tweaked apk files that work with Xposed framework and provide different features. On Xposed Framework app you will find a section where you can download lots of modules. You are free to download and install apk modules from the other developers websites and Xda forum as well. On the download section, tap the module you want to install, it will provide a detailed functionality explanation of the app. Scroll down to the bottom page you will find Install button. Tap on it, the app will download the apk file and install it. Once the module is installed, just tap on the entry name and you will be guided to a configuration page where you will get different aspects to control the settings on the module. Some modules may require rebooting your device for changes to take effect. Xposed framework has shown immense possibilities in Android customization features. Some of the users like me feel that Xposed framework can leave behind Projects like CyanogenMod and Paranoid Android ROM because you can configure everything your own, no need of pre-programmed and packaged firmware packages. With the selection of the modules you can get pretty anything a famous ROM is offering. There are lots of modules available now as we are talking new developers are programming more of them. We have handpicked the best modules available for the Xposed framework that we would suggest our readers to try. XBlast Tools: Developers have packed an essential tweak into a powerful toolbox module for the Xposed framework. Options are spread over multiple categories. You will have an extensive control over status bar animation, colors and fonts, quick settings and other modification of hardware button specific UI functions. All you need to do is a soft reboot for changes to take effect. Tinted Status bar: iOS 7 inspired developers to bring up a module for the Xposed framework that will provide options to control colors of Status bars and icons. You can get help for color coding here. Xposed StatusBar Mods: A status bar is most commonly used mods and this module give you control of your status bar settings. You can change the clock color, add AM/PM to Clock, make the status bar transparent or 1PX. XVolume: This is a simple mod that gives you 30 step volume control on your device and thus means more precise control. 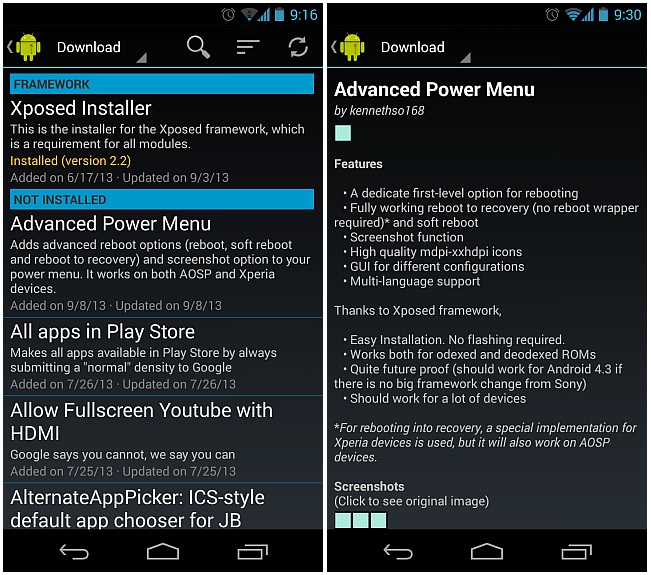 Advanced power menu: Again a popularly used mod on most of the custom ROM. It adds options like a reboot to recovery, Soft reboot etc. to power menu. Developers have added new features that stop anyone from turning off your device or switching it to Airplane mode if you Phone is locked. This way no one can stop Android device manager to track your device. Maximize Lock Screen Widget: This module allows users to maximize and control the size of the Lock screen widget and make it look much better. Wanam Xposed Module: Are you running an Android device and want some boom right now. Wanam Xposed module is built for Samsung Galaxy Android device users which are running TouchWiz interface. Lots of features are built into this package like call recording, extend reboot menu, secured keyboard etc. Per-app settings: Paranoid ROM users must be knowing about this functionality, which allows users to control and edit settings like DPI, Font scale, Screen dimensions on per app basis. Physical Button Music Control: You want to use Physical buttons like camera shutter or volume rocker to control any music player you are using on your Android Phone. Try this Xposed module to get this functionality. We would be adding more modules to this list as we discover more awesome modules. Please feel free to suggest the modules you like.